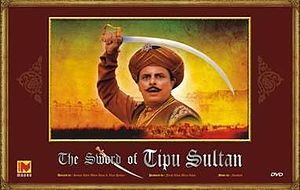 Way back in 1989 there was a historical drama aired on DoorDarshan – titled – The Sword Of Tipu Sultan. The serial is remembered for many reasons including the fire mishap occurred on the set of the TV serial. There was also the controversy associated with the TV serial that it didn’t represent the historical facts correctly. The serial was a dramatised representation of a book titled – The Sword Of Tipu Sultan – by Bhagwan S. Gidwani. And following that controversy, the producers have started displaying the message (disclaimer) in the beginning of each episode. So Don’t expect the TV serial to be historically correct. But it represents the time of British rule in India dramatically. The serial also doesn’t touch the disputed role of Tipu in Kerala and Koorg. It focuses on his fight against the British rule. The serial explores the lifespans of Haider Ali and Tipu Sultan both. Tipu was no doubt a very brave warrior and intelligent war strategist. His father Haider Ali was not able to study much, but he have a lot of skills. Of course Haider Ali was a excellent fighter, but he have the exceptional skill to collect intelligence information from the spies simultaneously. He was able to memorize and analyze them all very effectively. The fire mishap on the set (Mysore) was resulted into a remarkable financial loss due to a large amount of set was burn-out, and also number of causalities. Sanjay Khan himself was burnt seriously and had to remain in hospital for long. After being recovered, he continued shooting and the serial was completed. The serial also displayed the message that “This serial is dedicated to all the people who lost their lives in the tragic fire at Mysore”. It is worth to note that the music for this serial was given by the talented and famous musician Naushad. As we know British were outnumbered significantly by Indians, but it was their strategies which allowed them to rule. One of their motto was divide and rule. After conquering a major segments in north, east, west and middle India, the British rule was explored in south also. When they approached Mysore, SrirangaPatana and neighbourhood, Tipu was there to oppose and the clash between Tipu and British was happened. Tipu was known as “Sher-E-Mysore” (aka The Tiger Of Mysore). His father Haider Ali was son of Shaikh Fateh Mohammed. Shaikh Fateh Mohammed is known for his bravery in the war of Ganjikota. Now this TV serial is available for Home Entertainment as a set of DVD, so you can enjoy it at your leisure. If you love historical and patriotic tales or bravery tales, you will like to follow this blog, as we will be reviewing the episodes in a course. Apart from acting, music and DVD quality, we will keep reviewing other aspects of this serial as well.